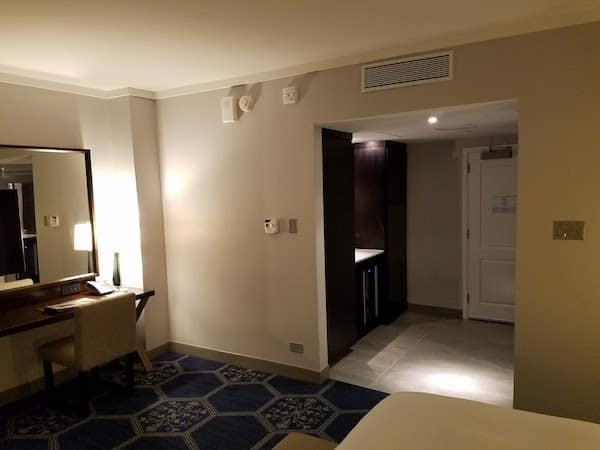 Back in November I booked three nights at El San Juan Hotel Curio Collection by Hilton in Puerto Rico when they ran a sale for $99 a night (+ tax and fees) for a two bedroom suite. 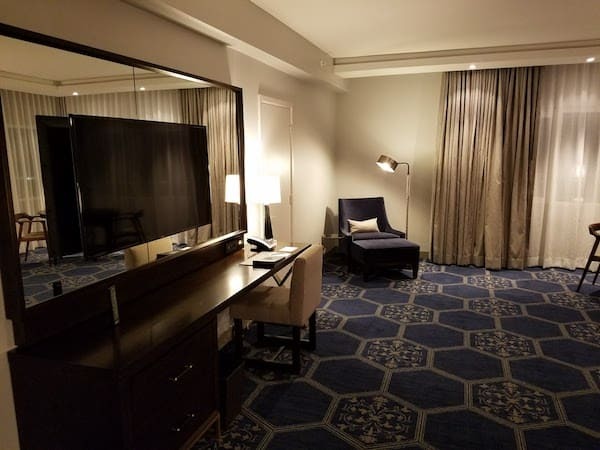 I was able to get the suite for Friday through Monday to make a long weekend trip. Getting to Puerto Rico is no easy task from Seattle. I’ve never been so decided to go for it. 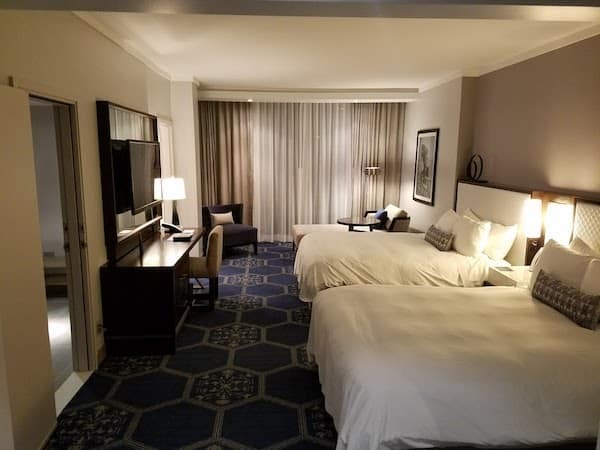 I booked a non-refundable room for a total of $390 for the three nights. 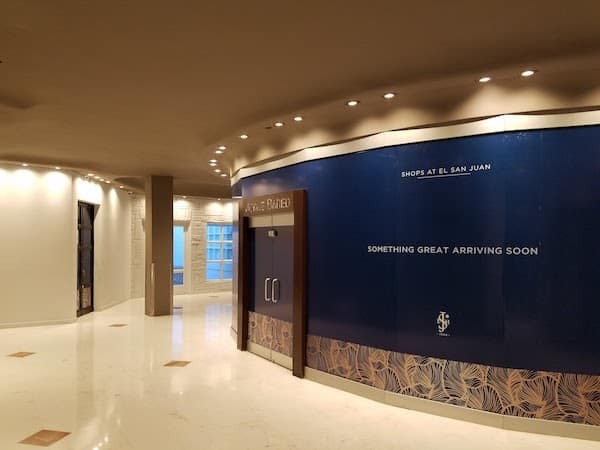 Between last November and now, the entire property closed for a few months for a complete renovation. The property has been under a number of names, most recently as Hilton (non-Curio) branding. During the process, my reservation got a bit wonky. I contacted the hotel and they assured me it was fine. Trusting them, I was off to Puerto Rico. 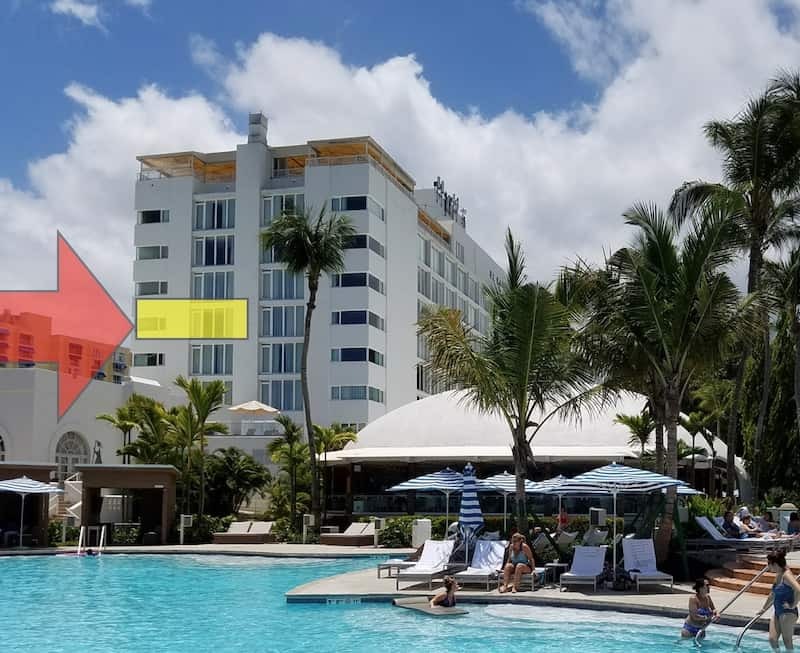 The El San Juan Hotel Curio Collection by Hilton is actually not in San Juan but instead is in Carolina; right next to the San Juan Airport. 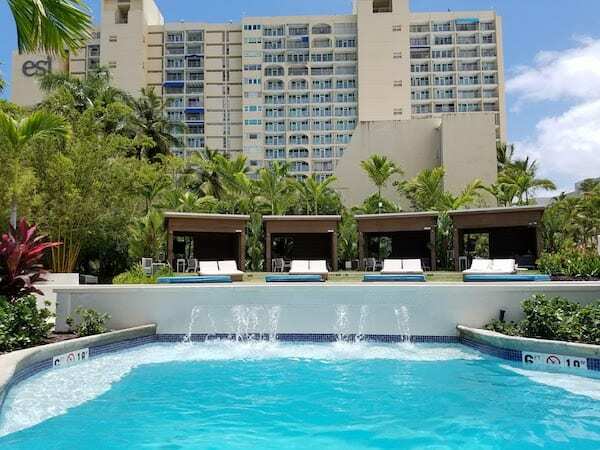 The hotel is a 10 minute taxi ride from the airport, and a 20 minute or so drive from Old San Juan. In Puerto Rico, Uber it is highly regulated. They cannot pick up at the airport so you are stuck with a $14 taxi. And Uber won’t pick up at the hotel, you have to walk outside the hotel gate to Lupi’s Mexican Grill for pick up. It is about $8 to Uber to Old San Juan and $5 to Uber back to the airport. 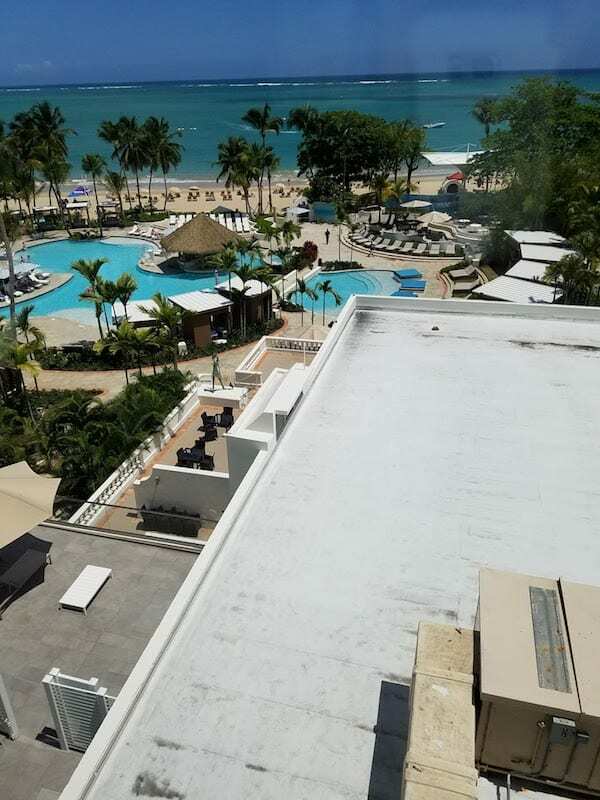 Located on Isla Verde beach, there is a row of hotel properties including the Ritz Carlton and InterContinental. There are a few restaurants (mostly fast food) within walking distance as well as drug stores and a grocery. But mostly you will want to stay on property or drive to something more scenic. 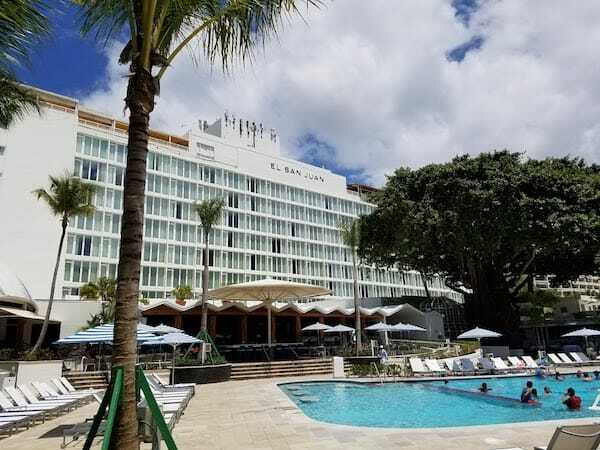 The El San Juan Hotel Curio Collection by Hilton was built in 1958 as a hotel and casino. 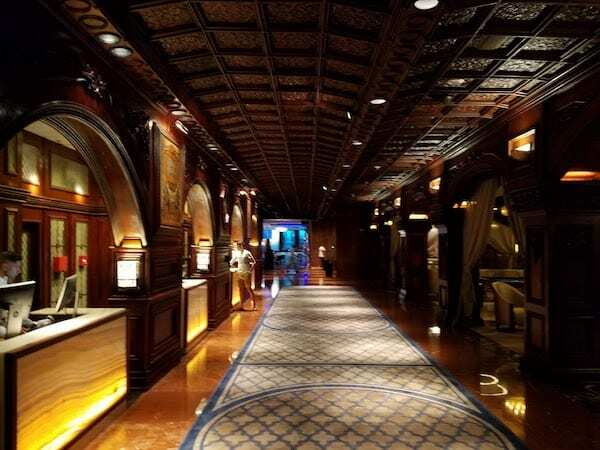 The lobby is beautiful and much of the original splendor remains. Dark wood work lines the walls and ceiling. 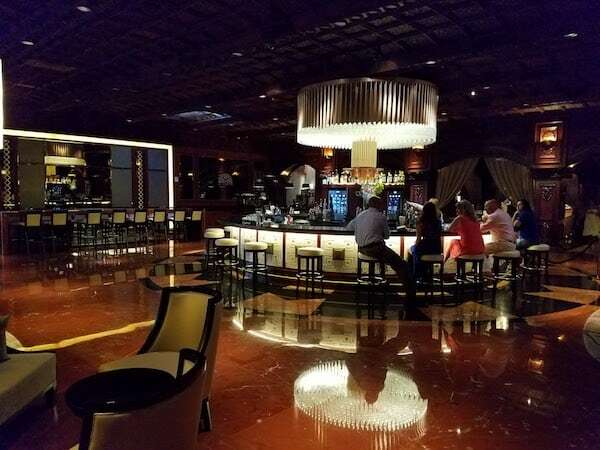 The casino was removed as part of the renovation and has been replaced by lobby seating and a bar. In the evening there is live music and a club onsite draws quite a crowd. I arrived around midnight. 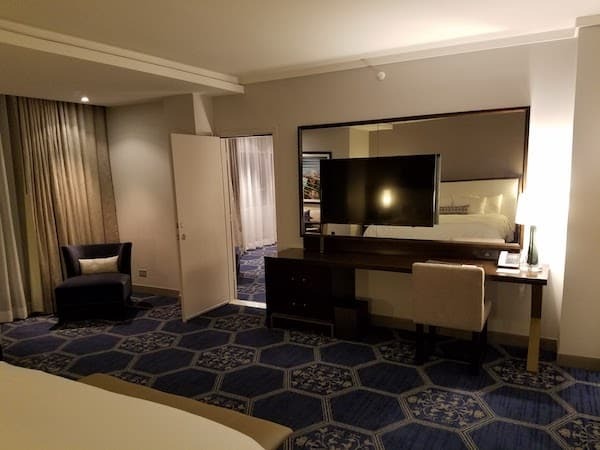 It was explained that the suite was essentially three connecting rooms — 636, 638, and 640. The building is only 10 stories so mine were mid-level. 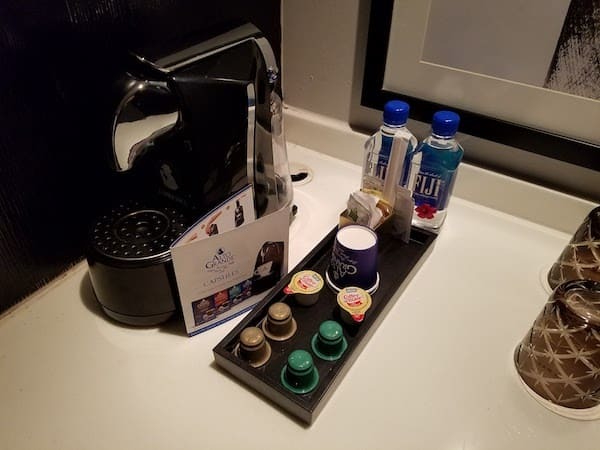 Typically guests are offered a free welcome drink but that late in the evening they do not have the amenity. The desk agent was quick to get me checked in. So quick that I had to ask about Diamond breakfast. I was given my key cards and told about keyless entry on the Hilton phone app. And I tried it out, and it worked. 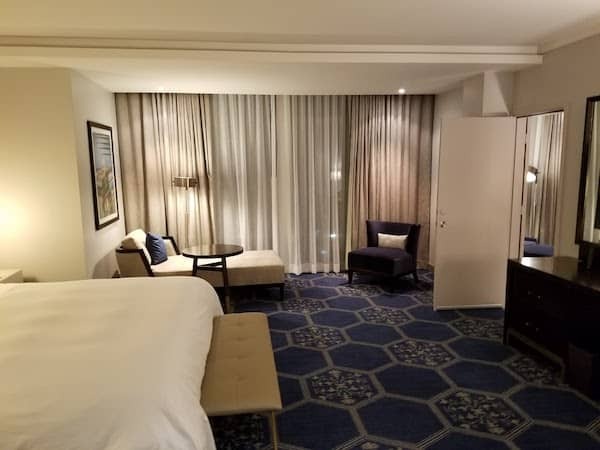 The two bedroom suite is made up of a Queen Deluxe Grand Tower Room (636) that connects to a large living room lock off space (638) which connects by lock off door to the standard King Deluxe Grand Tower Room (640). The three rooms combine to make up 1,374 sq feet. Map of the 6th floor. My room highlighted in yellow as seen from the pool/beach. The rooms are in the corner of the hotel facing the pool and ocean. 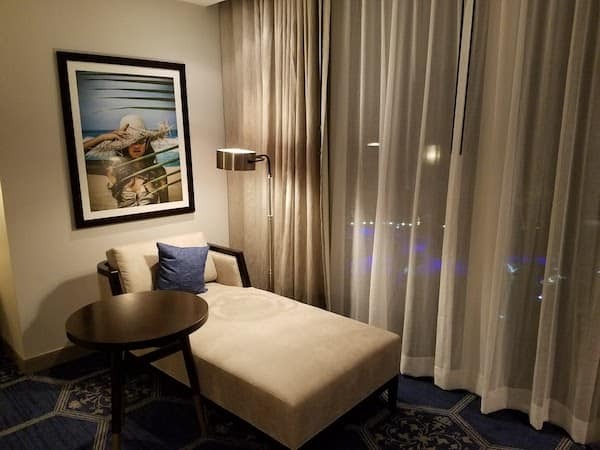 Because of this, the Queen room does not have a view of the water but the King room has a great view (if you look past the roof below). 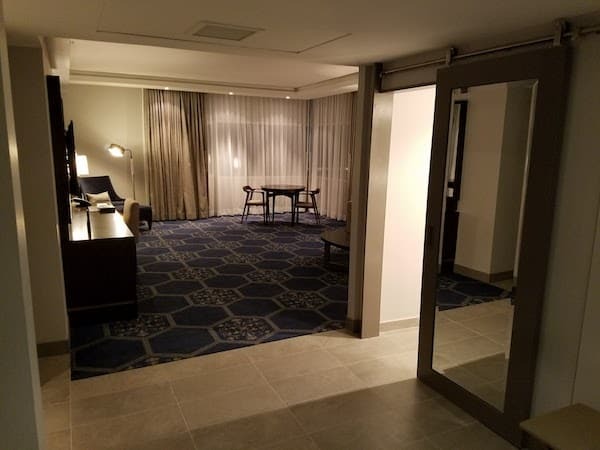 Each of the rooms have their own entrance to the hall, mini fridge, coffee maker, TV and lounge chair. 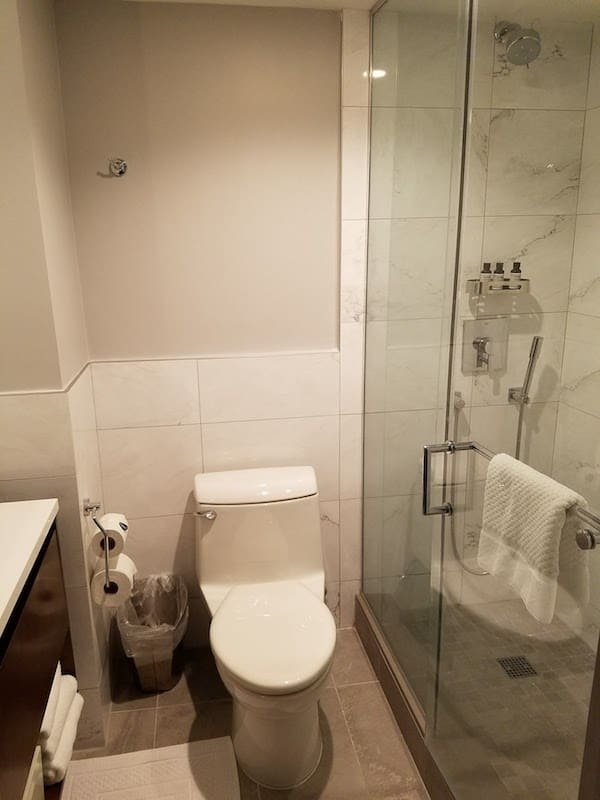 Each room also has a bathroom but they vary slightly in size (but not in amenities). 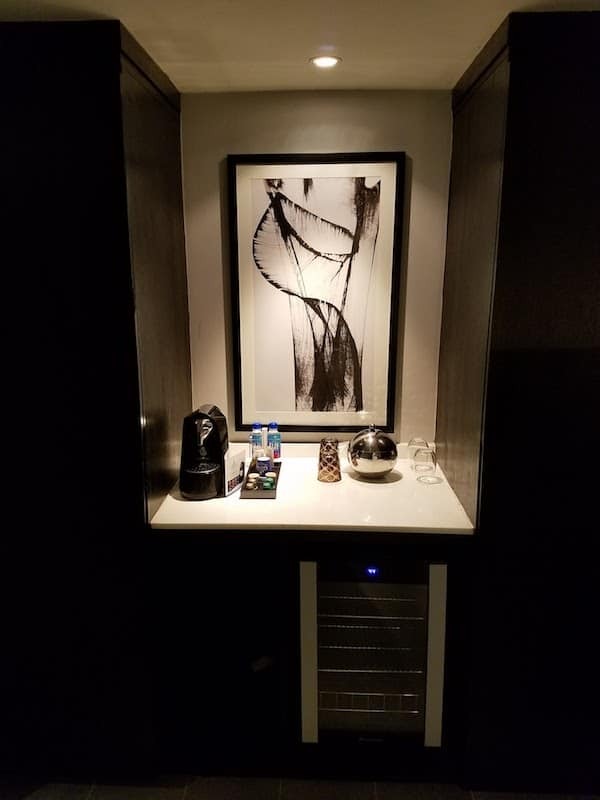 Each room has an identical bar area with coffee maker (capsules, like Nespresso). Two bottles of Fiji water are included. There is no sign about cost. I don’t know if they were provided (free) for me as a Diamond member or if they are provided for all guests. 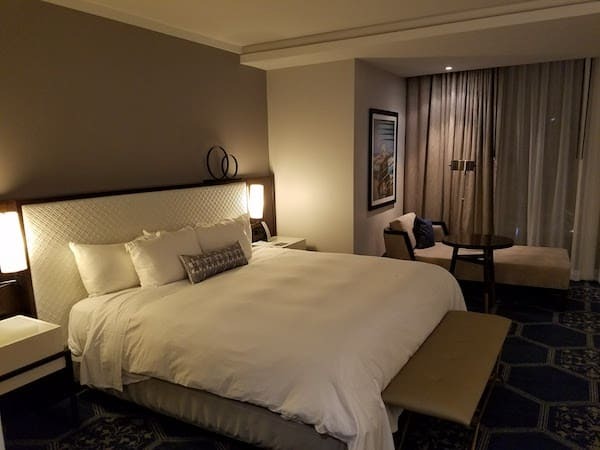 The waters are replaced each morning and during turn down service each evening. The mini fridge is empty and has a bright blue LED light that shows the temperature. I ended up having to cover it with a towel at night as it lit up the room. 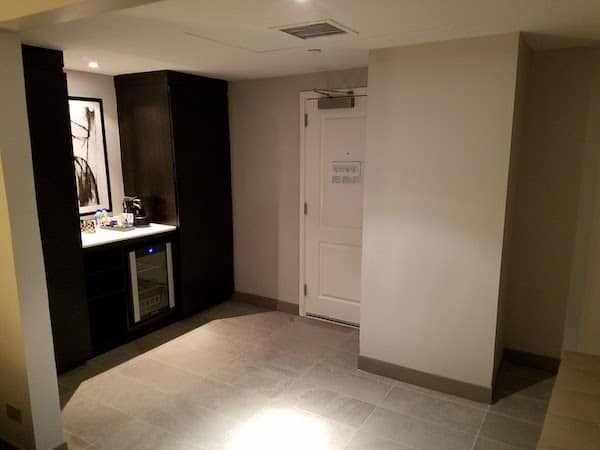 On either side of the fridge/bar area is a built in closet with robes and a safe. 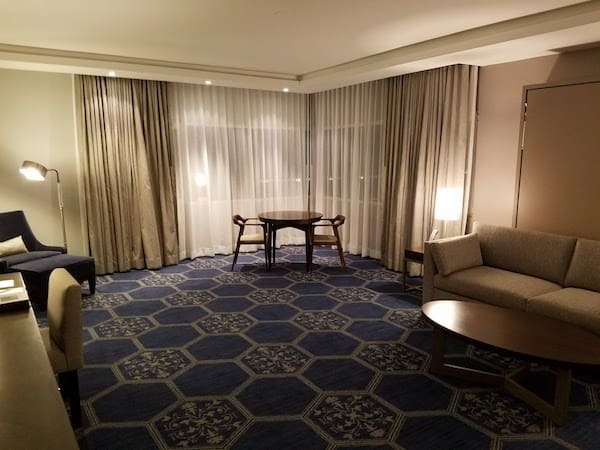 The living room is larger than either of the bedrooms and has windows on two sides. 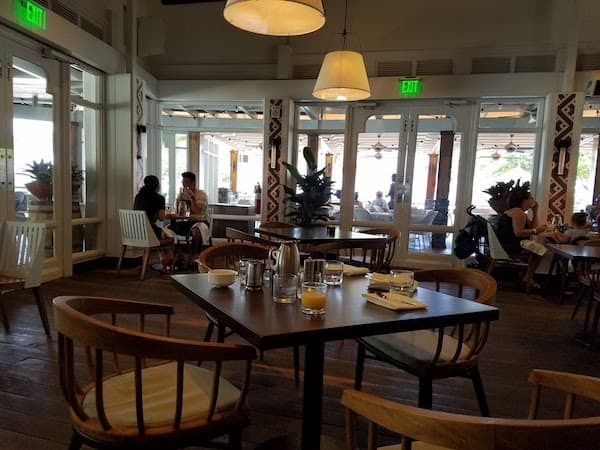 In addition to the lounge chair there is also a mid century modern style dinning table with two chairs. 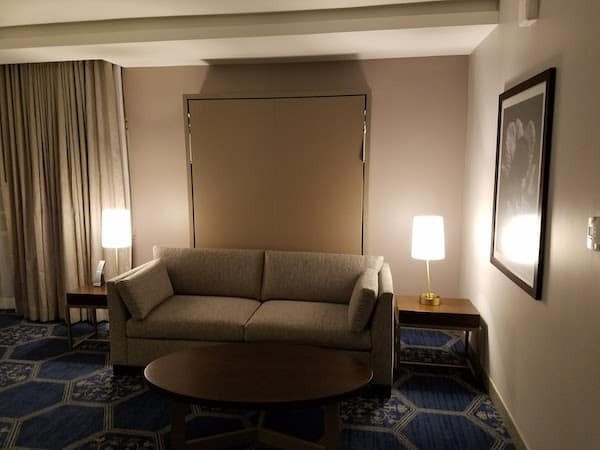 Against one wall is a couch and coffee table with a Murphy bed built in to the wall behind it. 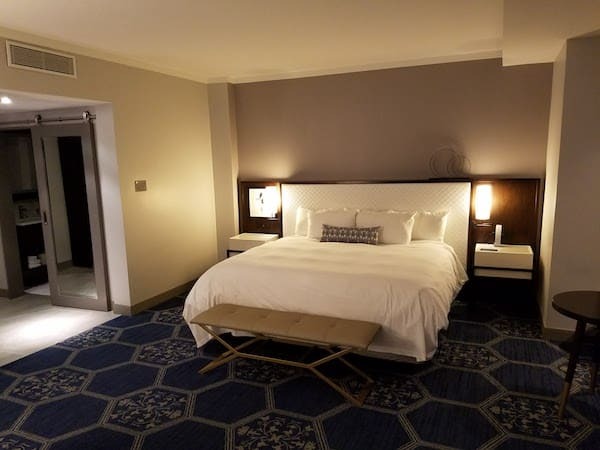 The rooms all feel very modern and are in great shape. Light colors with dark accents (blue carpet) and wood finishes throughout. 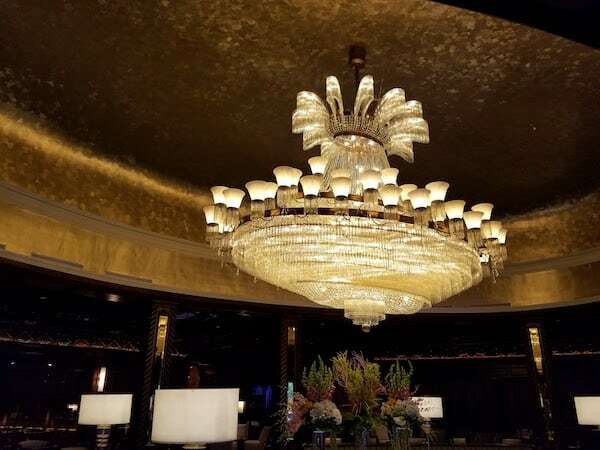 Lots of lighting options — floor lamps, table lamps, reading lights and recessed overhead lights. 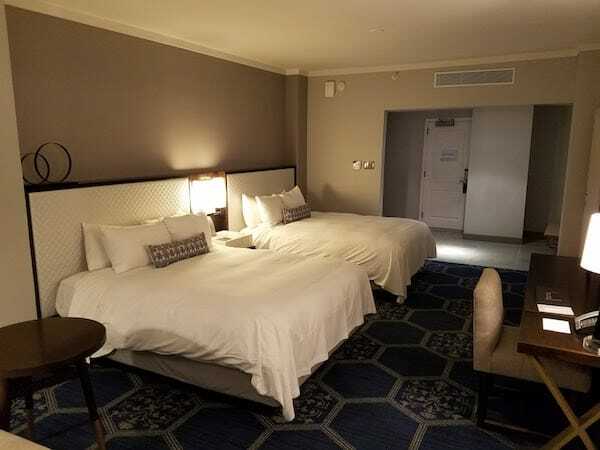 There are plenty of outlets (both standard power outlets and USB chargers) around the bed and throughout the room. Vintage style photographs and the furniture give it the mid-century vibe that is true to the roots of the property. The air conditioning worked great during my stay. Temperatures outside were around 90 during the day but my room was always comfortably chilly. My biggest complaint is the noise. One of the nights there was a wedding reception on the roof (4 floors up) and I could hear every word to the songs until midnight. The music at the pool during the day is also very loud. Don’t expect a peaceful time in your room between noon and midnight. 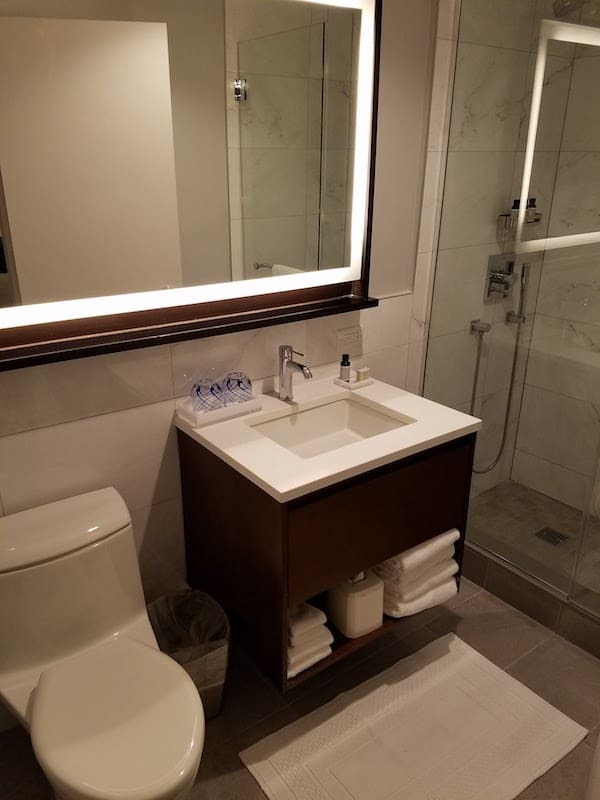 The bathrooms of the El San Juan Hotel Curio Collection by Hilton are tiny. The smallest is in the King bedroom where you can stand in the middle and reach out and touch every wall. 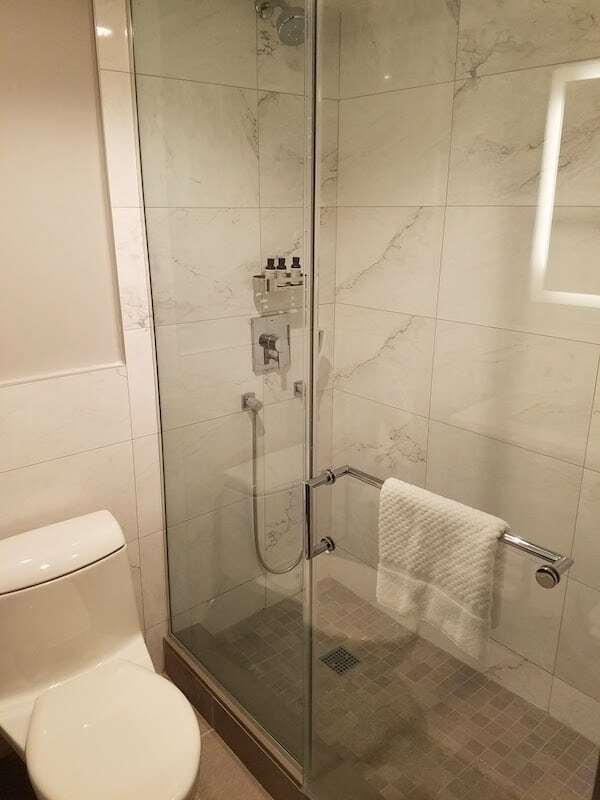 Each has a single vanity and walk in shower with glass door. 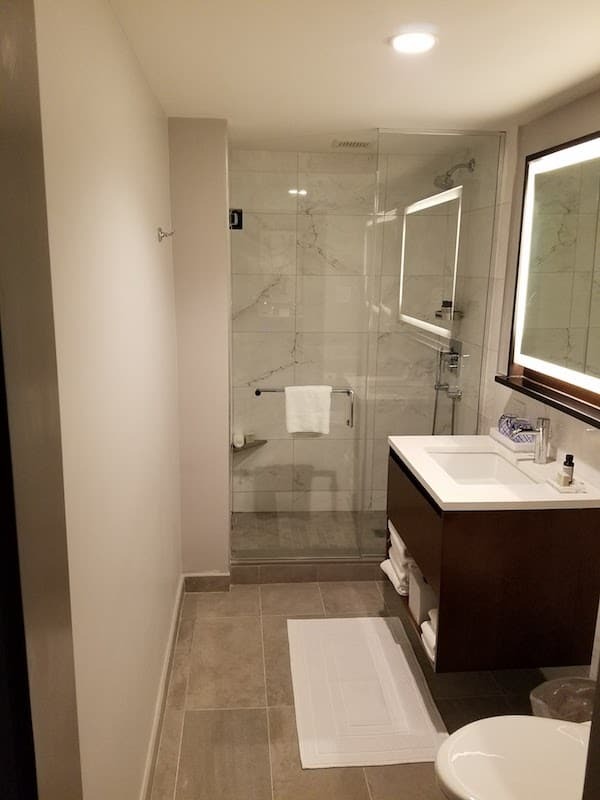 The suite has no bathtub which I find strange. 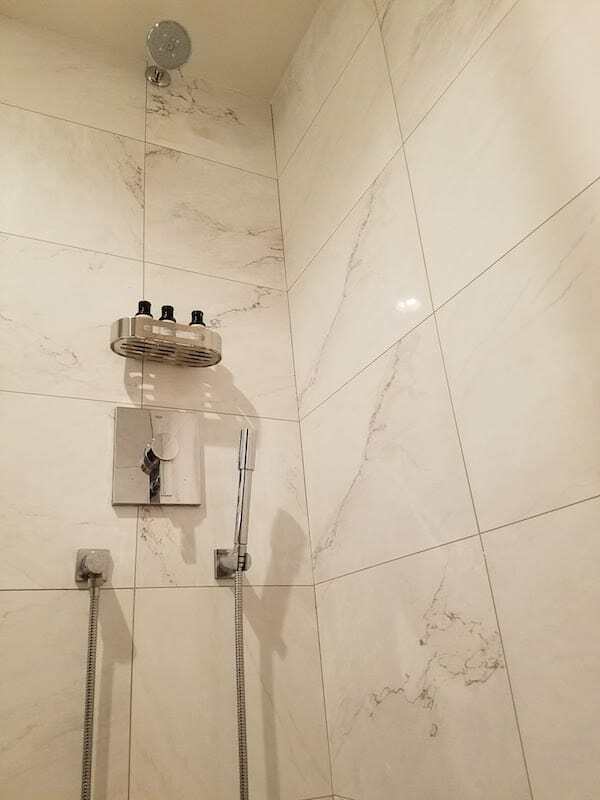 The shower has a standard shower head along with a hand wand though you can only use one or the other at a time. 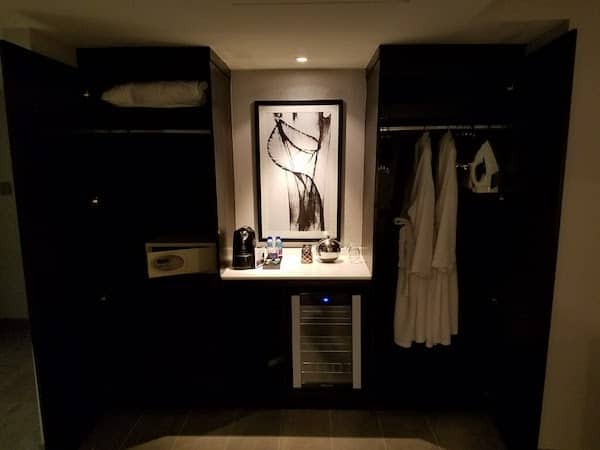 The towels and robes are all high quality. The bath amenities are labeled as “Lather”, it is unclear if that is the brand or just an in house label. The packaging is upscale. 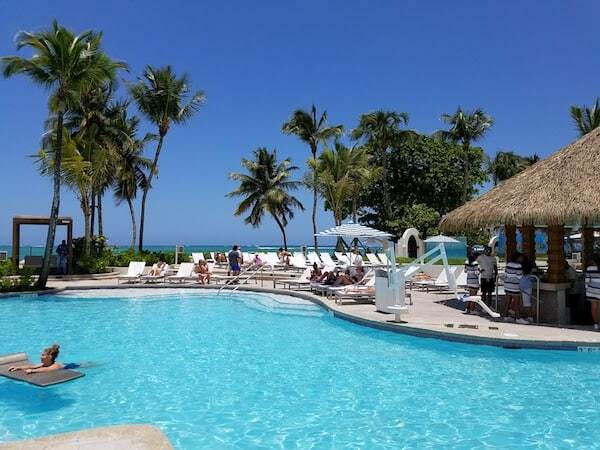 There are actually 4 pools at El San Juan Hotel Curio Collection by Hilton. Three pools make up the main pool area while a fourth pool is the “quiet” pool. The quiet pool is the first you see as you come out of the hotel. It is mostly square in shape with some built in under water tables. 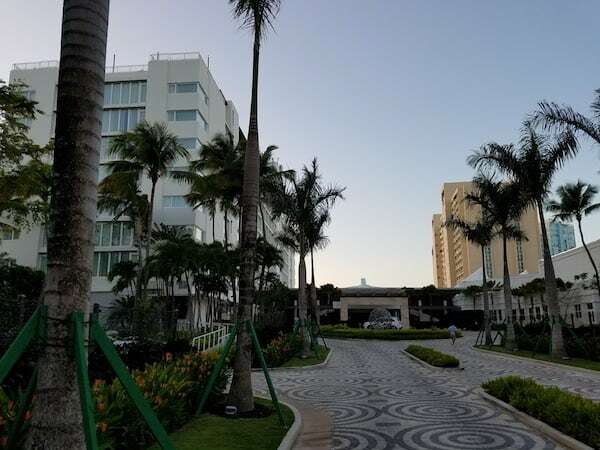 Along the perimeter are the cabana rooms. The two story building you see is the gym and, I am guessing, the soon to open spa. The pool complex is between the “quiet pool” and the beach. Both weekend days I went to the pool there was a DJ playing quiet loud music. 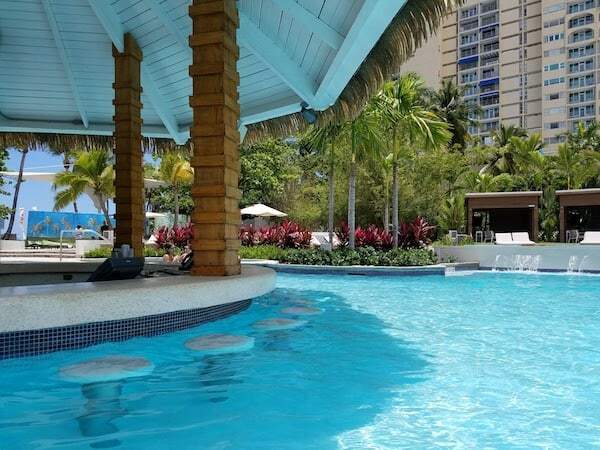 On Sunday, Brava, the popular club on the property, hosts a pool party. It is loud and high energy — think Vegas or Miami. I was always able to find a chair in the shade and the staff were very attentive. After setting me up with towels laid out on my chair, the staff brought water and offered cucumber slices. When the pool party was going on (and there were bigger crowds), they were less attentive. You could always go to the swim up bar if you needed a drink. Just beyond the pool complex is the beach. 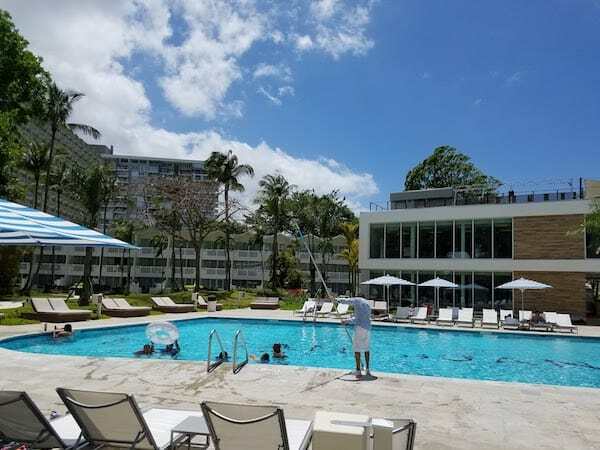 There are lounge chairs free to use for hotel guests but umbrellas cost money to rent. There are plenty of beach activities available as well. In addition to the pool and beach, there are a number of other offerings in the hotel. 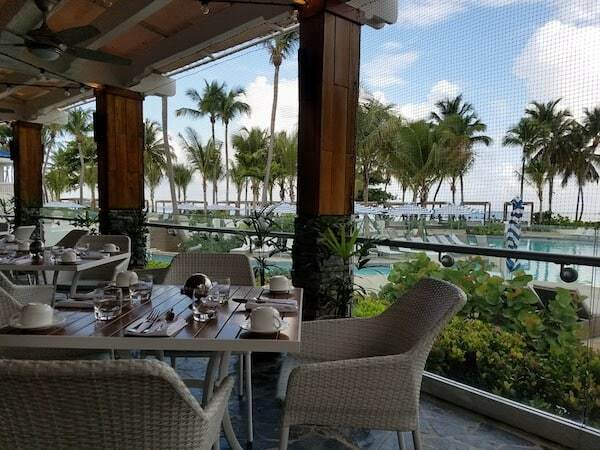 The main casual dining option is Caña located next to the pool and where Diamond members receive free breakfast. Meat Market is a more upscale steakhouse. 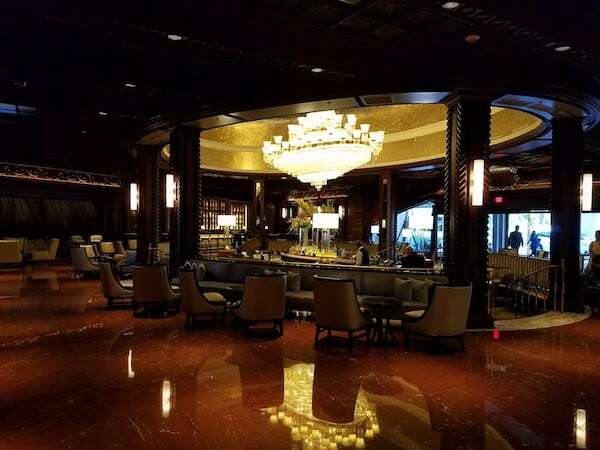 There are a number of bars and a coffee bar in the lobby. A collection of shops is adjacent to the lobby but most were still closed from the renovation. There is an Italian restaurant and a sushi bar is set to open shortly. 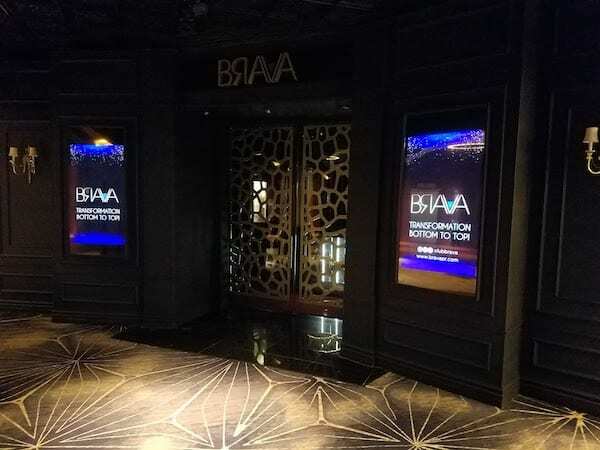 Also, there is a club on the main floor called Brava that is surprisingly popular over the weekend; I would guess mostly a locale clientele. 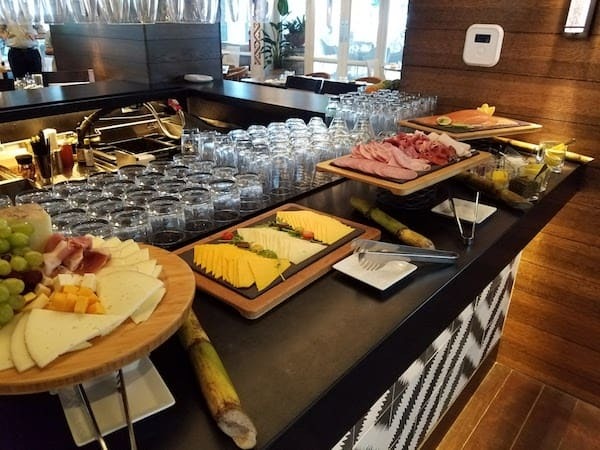 There is no Hilton Honors Executive Lounge at the El San Juan Hotel Curio Collection by Hilton so Diamond members get breakfast for two (per room) at Caña each morning. 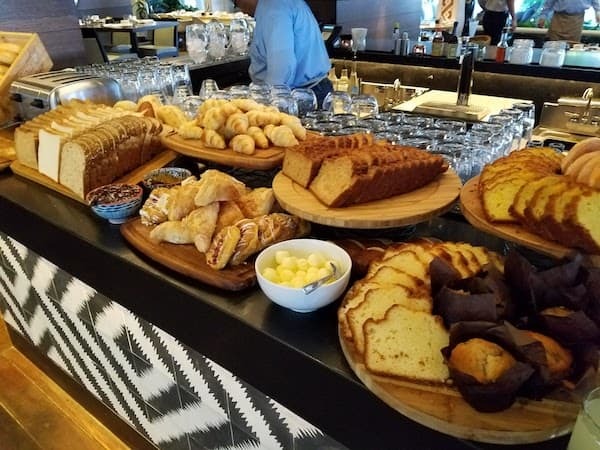 The breakfast is a standard buffet. Or you can order off the menu up to $25 per person. Espresso drinks are an additional cost. 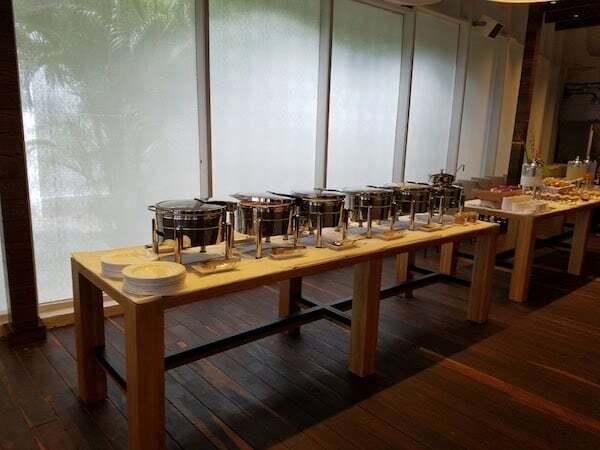 The buffet is mediocre. 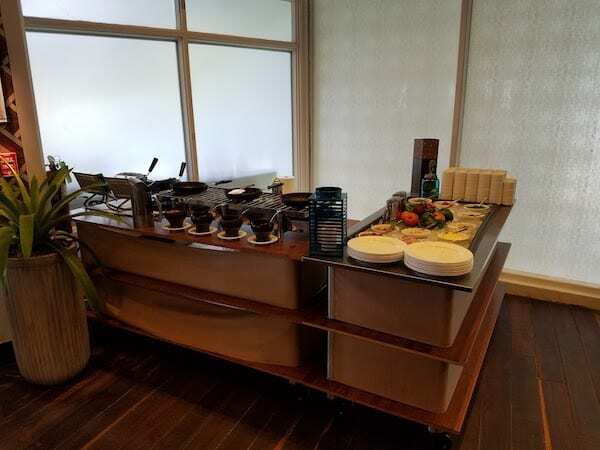 There is an omelet bar where you can also get basic waffles. The pastries are generic and I doubt they are made in house. 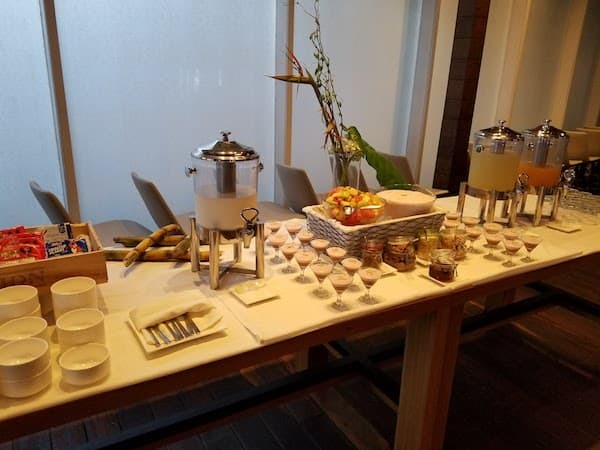 Each day there is scrambled eggs, potatoes, sausage/bacon, yogurt and oatmeal. Another couple of dishes rotate through. I found the fruit to be very low end — the typical cantaloupe, watermelon and pineapple with a few berries mixed in. Too bad considering there is great fruit in Puerto Rico. There is outdoor seating but it fills up quickly. As a result, two of the three days I was seated inside. 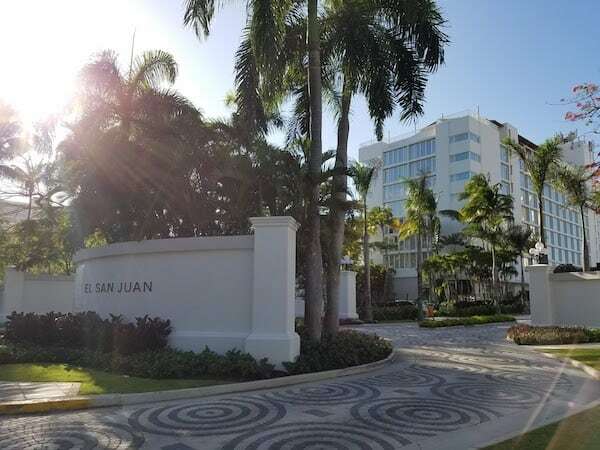 For the most part, I find the service to be top notch at the El San Juan Hotel Curio Collection by Hilton. Housekeeping comes twice a day in the late morning and again in the evening for turn down service. The staff all speak at least some English and are very friendly. I am especially impressed by the pool staff. From walking you to your lounge chair and setting up your towels to bringing slices of cucumber and water. They are very attentive with drink and food orders as well. But the service goes downhill at the pool a bit during the Sunday pool party because there are just so many guests. An entire team of staff clean the pool thoroughly each morning. 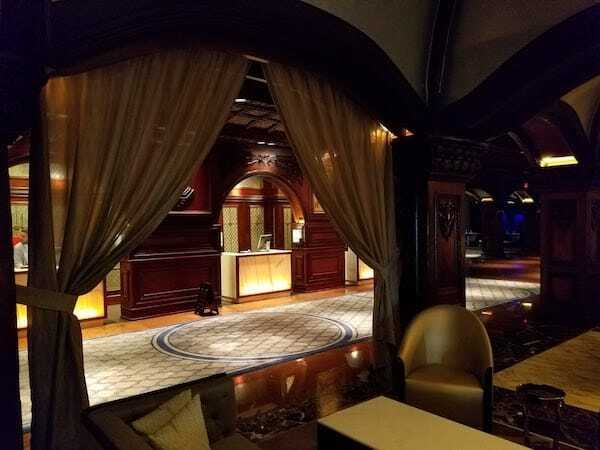 I spoke with the concierge and she was very helpful with suggestions of what to do and where to eat. In addition, the front desk staff are all very professional and I never waited to speak with anyone. 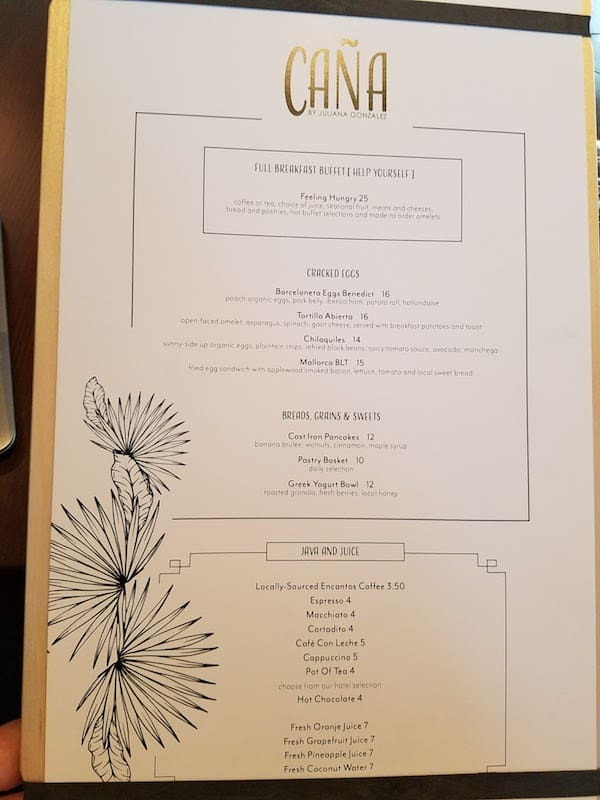 My check out portfolio was correct; I was a bit worried with all the oddities with the reservation but they figured it out without me needing to point anything out. 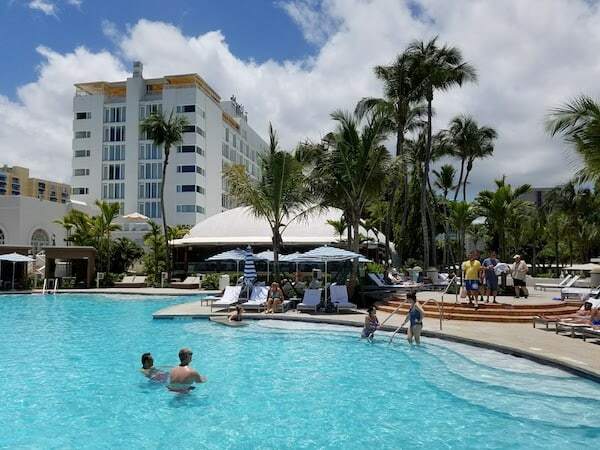 The El San Juan Hotel Curio Collection by Hilton is a beautiful resort property that would fit in in Mexico or Las Vegas. It is not a peaceful resort like you might find in Hawaii. The renovations are very well done and it feels modern and fresh. The staff is top notch. The pool and beach are wonderful. 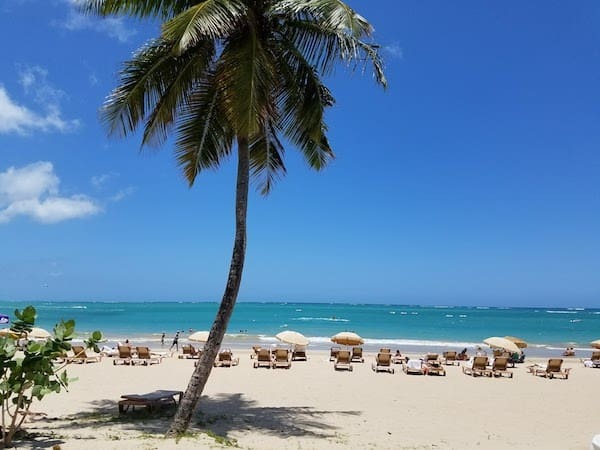 The location is not great; there is not much to do or see in the neighborhood and the other hotels are very close by. I have heard there have been complaints about the loss of the casino. But I didn’t miss it at all but some might wish to have that option. 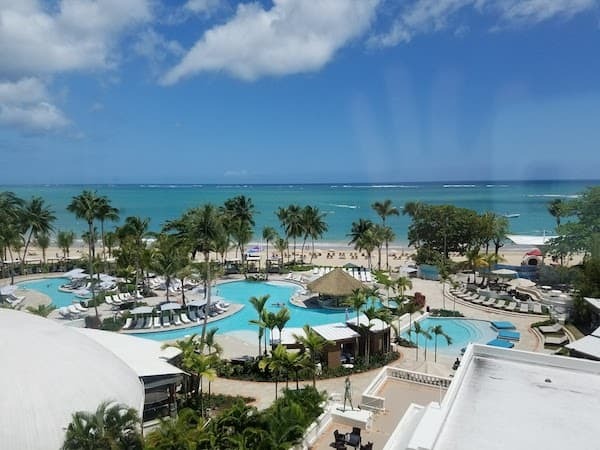 El San Juan Hotel is a wonderful option for a getaway in Puerto Rico. 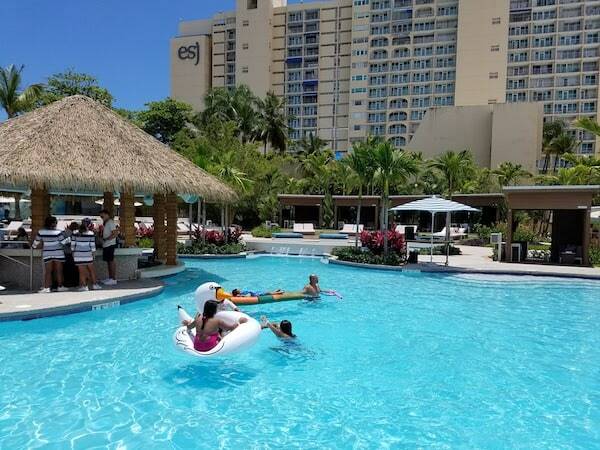 Have you stayed at the El San Juan or another Curio Collection property? What was your experience? Thanks for the thorough review. I am a diamond member and will be going to PR during the Christmas holiday this year so this is very helpful. I heard the property was hit hard by the hurricane. But I am sure they have been working hard to fix it back up; hopefully you won’t even notice! I enjoyed the property.